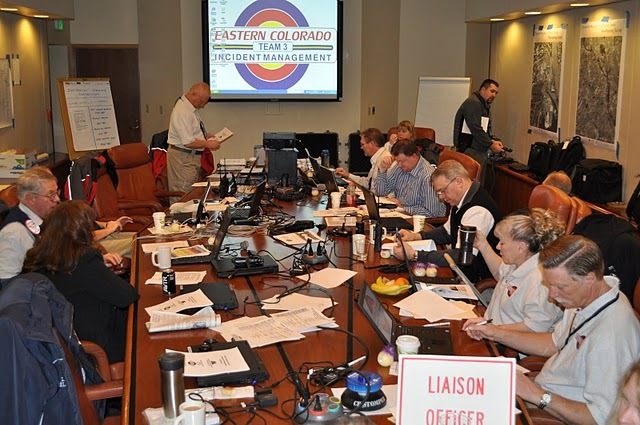 Lucien Canton's recent post about the 2010 Colorado Governor's Emergency Management Conference and associated training activities on the sidelines of the Conference is much appreciated. We were very fortunate to host Lucien as our keynote speaker for the Conference. With much thanks to the Eastern Colorado Incident Management Team, we were able to free up resources to accomplish training, maintain a response capability in a mobile, alternate Emergency Operations Center (EOC) and allow our EOC staff to break away to provide presentations and liaison with their colleagues attending the Conference. Ardent believers in transparent government and realizing that time, resources and flexibility are paramount in today's economy, we worked to make the entire Conference available online. So, if you are interested watching the presentations or reading all the conference slides/handouts, we have posted all of them on the site for the 2010 Colorado Governor's Emergency Management Conference online at COEMCON. There, you can learn more about the exchange of ideas at the conference, including special presentations on social media and emergency management, Colorado initiatives on private-public sector emergency management engagement and the Town Hall meeting hosted by both the Division Director Hans Kallam and General Mason Whitney of the Governor's Office of Homeland Security. And... "thanks" again to Lucien Canton for sharing his unique knowledge and experience!